Ideal for normal hair types, this emolient-rich conditioner is formulated with pure plant proteins, six provitamins, organic plant extracts and pure essential oils. Nourishes and strengthens your hair while replenishing and stabilising moisture levels. Salon developed and tested. 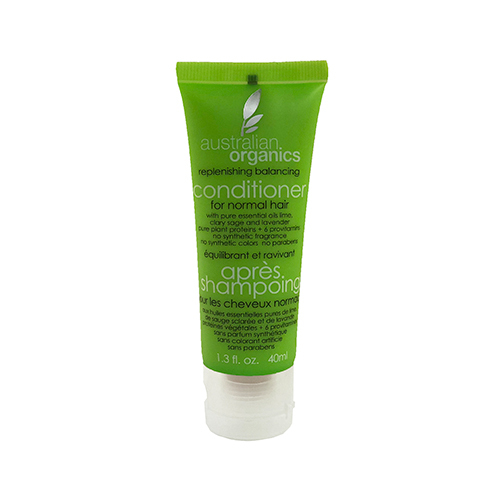 Improves manageability, eliminates tangles, and protects against split ends. Enchances flexibility and softness for full bodied, healthy, shiny hair. To use: After shampoo, apply a small amount to damp hair, starting at the ends and working through to roots. Rinse thoroughly. Aqueous Extracts of Matricaria Recutita (Chamomile**), Tillia Cordata (Lime Blossom**), Betula Alba (Birch**), Cetearyl Alcohol, Sesamum Indicum (Sesame) Oil, Centrimonium Chloride, Cocoamidopropylamine Oxide, Hydrolysed Wheat Protein, Wheat Amino Acids, Alcohol, PEG-35-Castor Oil, Polysorbate 20, Aesculus Hippocastanum (Horse Chestnut) Seed Extract, Retinyl Palmitate (Vitamin A), Tocopherol (Vitamin E), Inositol (Vitamin B), Calcium Pantothenate (Vitamin B5), Linoleic Acid (Vitamin F), Biotin (Vitamin H), Citric Acid, Sodium Chloride (Sea Salt), Phenoxyethanol, Caprylyl Glycol, Salvia Sclarea (Clary Sage) Oil, Citrus Aurantifolia (Lime) Oil, Lavendula Angustofolia (Lavender) Oil, Sodium Copper Chlorophyllin (Vegetable Colour), Limonene*. * Natural Component of Pure Essential Oils and Pure Plant Oils. Australian Organics do not use synthetic fragrances, synthetic colours or animal bi-products. Instead of harsh petrochemicals that can damage your hair, skin and scalp, Australian Organics utilise herb, flower, and other plant derived ingredients. Pure essential oils and plant extracts are used in place of synthetic fragrances and colours.